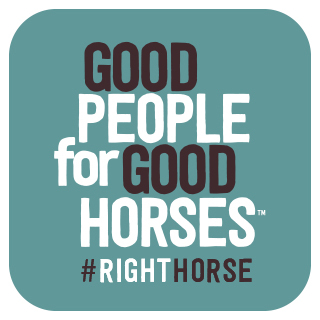 You’re probably wondering what in the world do these two things have in common. Well, my intimate musical experience this past Friday night brought the two together in such perfect harmony. I purchased tickets to see Kacey Musgraves at the Howlin’ Wolf months ago when her second album, Pageant Material, came out in June of this year. The day finally arrived and we headed down to New Orleans after work for a night of highly anticipated live music. After sitting in the usual Friday evening traffic on Lake Pontchartrain, we arrived just in time for the opening act of Humming House. When the rhythm of the bass drum, tambourine, fiddle, mandolin and acoustic guitar began on the first song Run with Me, I couldn’t contain the smile that was spreading across my face. I looked back at Andrew with big eyes and a kid grin as my boots started moving under my feet with excitement. The wide variety of percussion sounds mixed with beautiful vocal harmonies, robust instrumental attacks, chanting passages about life on the road, love, travel and new frontiers (my favorite topic this year), showed the band’s never ending talent. The elements of bluegrass, folk, soul, blues and jazz are intertwined with a balance of impressive vocals. To seal the deal, they performed a Justin Timberlake cover My Love. Enjoy this little sample but please excuse the poor quality of my videos – clearly I need to upgrade my phone. Watching these fiddle playing, tambourine slinging musicians break down that song and even add the beat box interlude was one of the best moments of the night. Shock followed by endless cheering was a clear indication of the crowd’s support. Needless to say, their albums have been on repeat since Friday. I’m in music love right now and can’t help but share just one more video with you. You should see the grin on my face as I listen to this song. The second portion of the Rhinestone Revue was the introduction of rhinestones, hot pink streamers, flashing lapels, and a talent competition. My lady-love Kacey Musgraves showed up in glitter from head to toe with her band dressed in pink western suits flashing lights on their lapel and down the sides of their pants. In the midst of lights, swirling projections and of course, a disco ball, they brought us Pageant Material in honor of her new album. On every song, I was more and more impressed with Kacey’s ability to sound EXACTLY like her album. Minus the roaring crowd and some fleshed out instrumental pieces, it was as if you inserted her CD and pressed play. Towards the middle of her set, there was a short break for the talent competition of the Rhinestone Revue. This was an interesting compilation of funny “drunk guy” impersonations and an overview of her band mate’s carpentry talents. A talent competition at a concert was a first for me but was thoroughly enjoyable. Another highlight was her cover of Miranda Lambert’s Mama’s Broken Heart. Me and the rest of the crowd were dancing like crazy and singing at the top of our lungs. When she played Blowin’ Smoke, one of my favorites, we received a wonderful rendition of the song from some random drunk lady in front of us who seemed to be singing to the couple standing next to me even though they had no idea who she was either. It was a good laugh to watch her sing her heart out to us and then stumble off. When she covered Nancy Sinatra’s These Boots Were Made for Walking, the fiddle player from Humming House, Bobby Chase, joined Kacey’s band. All of sudden, I saw Leslie Rodriguez, one of the lead singers of Humming House, pushing through the crowd towards me with a camera in her hand. She stopped and took a picture of Bobby Chase’s beautiful moment on stage. We made sure to express to her how much we enjoyed their set. That was a nice treat that I will forever remember. Kacey closed out the show with the song that brought her to the forefront of country music which was Follow Your Arrow. At one point, she and her band quit playing and the crowd kept singing the chorus word for word. She seemed impressed as she looked at her band mates and the crowd kept the song going. You could tell she felt the love in the room that night. 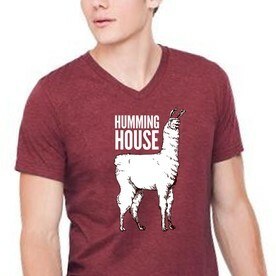 We stopped by the merch table and picked up some llama shirts from Humming House that we couldn’t pass up. Me and Andrew have a thing for llamas – yes, we have a thing. 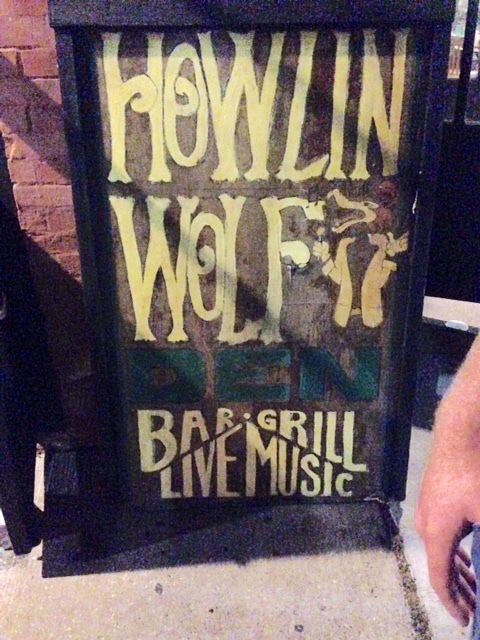 Since we had to rush to New Orleans, we skipped dinner earlier and sat down for a bite at the Den which is attached to Howlin’ Wolf. I wasn’t sure how good it would be since it’s really a bar with a few tables but it was very good. Both the Chicken Philly and the Chester Burger are delicious and you get to watch your order being cooked as the kitchen portion is open to the public. They open all the French doors and you really experience the New Orleans vibe that way. I left that night feeling full in my belly and full in my heart. Live music makes my soul smile and discovering a new band like Humming House was the greatest gift of the night. 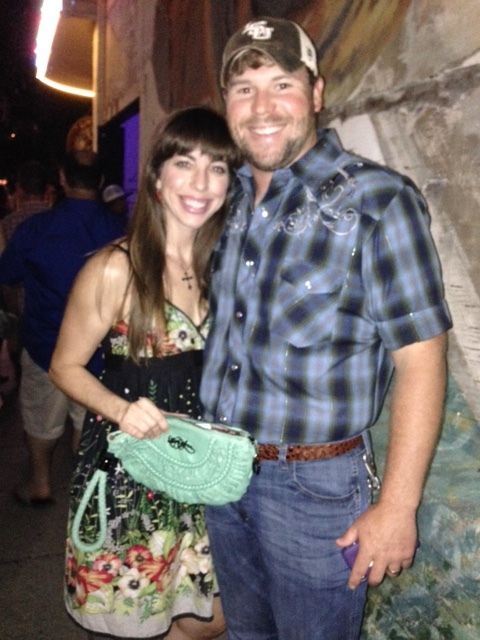 The fiddles showed up and the rhinestones shined bright! Absolutely! 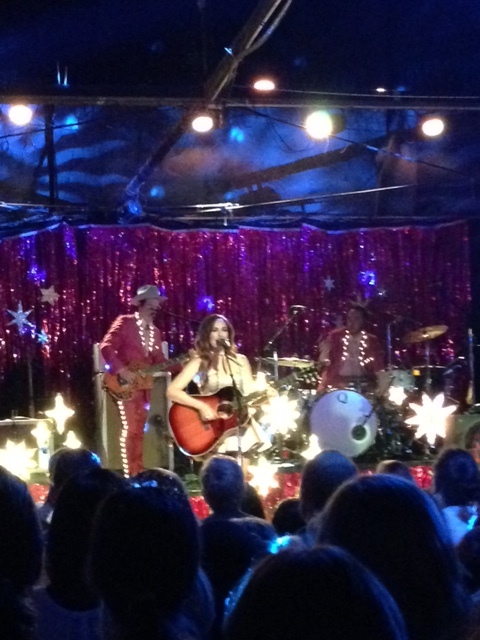 I love how Kacey Musgraves plays in low key venues. It ends up being a very intimate environment.